Huzur repeats these words of the Promised Messiah (as) again: Good, virtuous conduct is that in which there is not even the thought of any kind of excess or wrongdoing, or conceit, or ostentation, or arrogance or dispossession of the rights of human beings..
“Just as man is saved by his good deeds on the day of Judgment, he is saved in this world in the same way,” meaning that good conduct has value here in this world also. This means that just as good deeds will result in benefits in the Hereafter, they will lead to good results here also. Or this could also mean that just as Paradise is earned by such good conduct in the after-life they can also make our lives paradisiacal here. He says: “You should attend to your actions with a determined resolve, and a solid and binding pledge.” This means we should make a strong and binding pledge. Then likening faith to a tree, the Promised Messiah (as) goes on to say that even the very best tree needs to be treated with care and taken care of in order for it to be of benefit to the people and indeed remain alive. One has to attend to it and take care of it. In like manner, in order to perfect one’s faith, deeds or actions are needed. And one’s own faith is in need of care and attention with one’s deeds because without this even while having faith, or while claiming to believe, one can not be called a momin, a true believer. Without deeds or actions, man is like a tree whose beautiful green branches have been cut to make it look disfigured, whose fruits have been discarded and left to rot and from whose shade-giving branches the creatures of God have been deprived. The branches of a tree, no matter how strong its roots may be, if it is deprived of nutrients from fertilizer, and if its budding branches and shoots are laid waste, after some time, that tree will die. Its strong roots will afford it no benefit. Even if it remains alive for some time, such a tree, barren of branches and yielding no benefit, will attract no one’s attention. No one will look at it even. The attention of everyone will be drawn towards that beautiful tree or plant, and everyone will look towards such a beautiful tree or plant which is green and lush and whose beauty can be seen and which, at the appropriate time, becomes laden with flowers and fruits, which affords shade on a hot day. It is such a tree that the people would like. So, without a doubt, faith is like the root of a tree. And without a doubt a Muslim makes the claim that my faith is strong. We see this being expressed frequently by Muslims and they have a jealousy for the honor of the faith also. Many among them become ready to fight, and to kill or be killed for the sake of their faith. These days, there are two different groups that have come into being and formed all sorts of organizations and all kinds of claims are made by them regarding the strength and firmness of their faith – but are they like this beautiful tree or like a beautiful garden that is proving of benefit to the world, and are the people, by seeing its beauty being drawn towards it in their droves? The intensity with which these extremist groups are perpetrating their extremist acts, with the same intensity the people of the world are shunning them and running away from them. The faith which the Holy Prophet Muhammad (sa) had brought had succeeded not only in drawing even its bitterest enemies towards itself and making them into its friends but indeed had made them into its passionate lovers who had, so to speak, become imprisoned in its intense love. The effect of the teaching of the Holy Prophet (sa) was such that when a Muslim government, at one place, thought that they could not successfully defend against the Roman government, and decided to leave a captured territory where the majority of the people were Christians and Jews – the Christians and Jews of that territory got together and bid farewell to the Muslim army crying and weeping and said that we pray that you again capture this territory so that we may continue forever to benefit from your shade-giving and fruit laden tree. The facilities that you have provided, none of our governments were ever able to provide to us. They valued those Muslims because with their faith, their every deed and action, was beneficent. So empty declarations and expressions of faith and of the strength of its roots, serve no purpose until and unless the green and lush branches of good and virtuous conduct and the fruit of such branches is not visible with all its beauty and splendour and are not proving of benefit to the people. And when this beauty and beneficence is evident the world also is drawn to it and pays attention and gathers around it and puts forth its efforts to safeguard it. This is why Allah, the Exalted, has commanded every Muslim to not only be of strong faith but rather in almost every place where faith is discussed, mention is also made of good and virtuous deeds – making the two conditional one upon the other. And to develop this condition among the people Allah, the Exalted, sends His Prophets. This condition is born within the believers at such a time when they develop a connection with the Prophet of the Age. As I have said, there are some very large groups who, in the name of religion and of faith, express the strength of their roots but what is it that we observe happening? Not only are their own mutual hatreds increasing, and one group, in order to establish its supremacy over the other, does all it can, using just or unjust means, by tyranny or excess and wrongdoing, but also the non-Muslim world is becoming fearful of Islam because of them. Today, it is the duty of every Ahmadi to present a true picture of these good and virtuous deeds because he has accepted the Imam and Prophet of the Age. The Jama’at of the Promised Messiah (as) is indeed that tree planted by God Almighty whose roots are strong and whose branches also are green and lush and beautiful and fruit-bearing and which draw the attention of the world towards itself. And this is all because the Promised Messiah (as) introduced us to the true teachings of Islam and encouraged us to follow in the footsteps of the Excellent Exemplar, the Holy Prophet Muhammad (sa), and laid great stress upon it and drew our attention to it and made clear its importance to us. 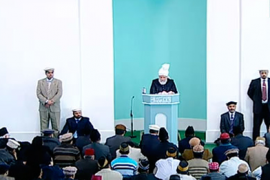 So it is the Ahmadiyya Muslim Jama’at alone whose roots are strong and branches are green and lush and beautiful and fruit-bearing and which draws the world to itself – this is that tree by seeing which, in every part of the world, the people ask what type of Islam is it that you are presenting? There are innumerable examples of this that come to pass that, by seeing the beauty of true Islam, people are left amazed and astounded. In Africa, in one place, a mosque was being inaugurated, a local Chief, who was a Christian, also had been invited, and so he participated. He said plainly that I have not come because of my love for you, I only came to see that what type of Muslims are these, in this day and age, who have invited a non-Muslim and a Christian also to the inauguration of their mosque. And now, coming and seeing that people from different religions are gathered here, I am even more amazed. And Ahmadis, being Muslims themselves, are demonstrating such high levels of moral excellences that has no equal. They are meeting everyone, whether small or big, rich or poor, with love and affection and they have such wonderful relationships and such high moral qualities that they are displaying here as cannot be seen anywhere else. This Chief came and said that such mosques and such Islam is the need of the hour. So he said that all my doubts and suspicions that I had about Islam have been dispelled. He went on to add that you have not just given this area a new mosque but rather you have bestowed upon us a new life. You have taught us the lofty values and ways of life. These are the kinds of trees about which the Holy Quran has stated that their roots are strong in the ground, and because of faith and good and virtuous acts, if men are likened to trees, then their green and lush branches are such as to be touching the heavens. Thus, as I said, because we believe in the Imam of the Age, it is the duty of every Ahmadi that along with having strong faith become such green and lush branches, become the beautiful leafs of the green and lush branches, become the beautiful flowers and fruits that adorn those branches which should not just look beautiful to the world but should also be of benefit to them. Otherwise, being perfect in faith and belief without actions is of no benefit. As I have told before that the people who apparently are perfect in their faith and beliefs, or appear to be so, or declare themselves to be so, yet they are becoming the stumbling block for the people of the world. We can discharge the obligation that is upon us by virtue of being Ahmadis when we become such as can manifest our good and virtuous deeds to everyone. When we can become the people of our street and city and country who show the beauty of Islam by our good and virtuous actions. We should be not be like those who are involved in any kind discord and disputes, nor such as involve themselves in gossip, slander or backbiting, nor should we belittle others, nor should we be like those who are devoid of mercy, nor like those who follow good with taunt and injury. Indeed we should be such as safeguard themselves against such bad actions. We should instead be those who demonstrate the highest good morals. The Holy Quran tells us again and again to adopt the highest of morals. Because these things are done by those who do not believe in Allah and the Last Day, whose faith is weak, and not just weak but who, in fact, are devoid of faith. Allah, the Exalted, has directed a believer, again and again, in many places in the Holy Quran, with reference to different things, that along with faith, good and virtuous actions are necessary and that there are a variety of benefits of this. Thus while a believer becomes a source of benefit for the others through the doing of good and virtuous deeds, he himself also is found eating the sweet fruits of these good and virtuous actions. For example, Allah, the Exalted, says concerning those who believe and do good and virtuous deeds that such people shall be those who shall attain the forgiveness of Allah. These people shall be the ones who shall be bestowed high elevated stations in Paradise. They shall be in such Gardens wherein streams shall be flowing and they shall be the owners of those streams. Then Allah, the Exalted, says that those who, along with faith, had done good and virtuous deeds, shall receive such great and best rewards as are beyond your power of comprehension. A simple declaration of faith alone does not give one the right to receive the best of rewards, but rather, if faith is accompanied by good and virtuous deeds, then one will become the recipient of the best of rewards and one will be bestowed with Gardens and become the recipient of God’s forgiveness. Then it is also stated that those who, together with faith, also do good and virtuous deeds, shall be bestowed with pure provision by God Almighty – provision that is for this world and also for the Hereafter. Those who do good and virtuous deeds shall have no fear. They shall be in peace. They shall suffer from no kind of worry or preoccupation. They shall not have fear of this world nor of the world to come that they were not able to do any virtuous deeds. Allah, the Exalted, will bless their hearts with comfort and satisfaction. And how could they have any fear – they were those who did good and virtuous deeds for the sake of winning the pleasure of God. After doing every good and virtuous deed they are going closer and closer to Allah, the Exalted. The word used for love here is ‘wudd’ which does not connote a superficial type of love and connection but means a deep love and profound connection. Such strong connection as could never be rent asunder. In fact the relationship or connection that is meant is like when a stake is driven forcefully into the ground – that type of strong connection is what is meant here. This is how that love should be established in the heart. Thus this verse would mean that for those who have strong faith and carry out good and virtuous deeds Allah, the Exalted, shall, for such believers, put His own love in their hearts as if forcefully driving a stake into the ground. They shall love God in this manner and then they will go on advancing in their faith and in the doing of good and virtuous deeds. Or it could mean that God Almighty will have such love for such believers as will never end. Thus if the love of God become so forcefully embedded in the heart of a human being or God should love the believers in such a way as if their love has been embedded in the heart of God Almighty, then who can be more successful than such a person. Such a person becomes in his own being such a beautiful and shade-giving tree which gives benefit to others because his every action, due to the love of God, is such as earns the reward from God Almighty and bestows benefit upon others. Then this verse also means that Allah will place firmly, in the hearts of such as have faith and do good and virtuous deeds, the love of humanity also. Thus, a true believer can never even think that he should inflict pain and suffering upon another human being. Love for humanity requires that a true believer always remain in the mode of thinking how he can be of benefit to humanity. As I have said earlier, if this thinking were to develop and take root among the Muslims, then depriving each other of their dues, committing injustices against one another, and killing people which are found among their governments, and other so called organizations, and the common people – and these days we see such actions very routinely – would never be seen. The teachings of Allah, the Exalted, are not being acted upon at all. This is why all this is happening. But the injustice of it all is that all this tyranny is being carried out in the name of Allah, the Exalted, whereas Allah, the Exalted, says that you should develop ‘wudd’ – the deep and profound love that should become embedded in the hearts as a stake driven into the ground forcefully. Become such people as are the source of beneficence for others. Thus, if the real and true teachings of Islam were acted upon we would never see the pain and suffering that is being inflicted upon each other in the Muslims world. And a beautiful visualization of the Islamic shade-giving tree would grow in the minds of the people of the world. Then this verse may mean also that in the hearts of humanity the love for the Muslims would become established similarly forcefully as a stake driven into the ground strongly. Allah, the Exalted, does indeed possess the Power that He should make this happen but in order for this to be attained He has made it incumbent that along with faith there be present good and virtuous deeds. As I have said, the Muslims of the first epoc were loved by the people – it was the love that Allah had placed in the hearts of the Christians and the Jews, who used to cry when they would see the Muslims leaving their lands and used to pray for their return. Indeed history tells us this also that the Jews used to say that we are willing to lay down our lives but will not permit the Christian army to enter the city, you should stay here and we will provide security. This was the impact of the righteous deeds which was demonstrated by the Muslims at every stage and which had drawn the attention of the world towards this beautiful tree and had been a source of much benefit for the world. Today, it is the responsibility of the servants of the true servant of the Holy Prophet (sa) that along with making firm the roots of their faith they become the beautiful leafs, branches and fruits of the tree of good and virtuous deeds which should attract and pull the world towards the beauties of Islam and which should be the source of benefit for the world. We should be those who love Allah, the Exalted and we should be the ones who win the love of God also. Our priority should be to love humanity and we also should be the ones who win the attention of humanity, because without doing this we cannot fulfill the purpose of entering into the Baia’at [Oath of Initiation] of the Promised Messiah (as). The Promised Messiah (as) has drawn our attention to this many times in his writings, discourses and meetings that we should turn our attention to the doing of good and virtuous deeds. That we should pay attention to our actions and that we should perform such good and virtuous deeds as are in accord with the will and pleasure of Allah, the Exalted and which should be such as save the world from pains and suffering. Only such a one enters into our Jama’at who makes our teaching a guide for his actions and acts upon it to the best of his abilities and capacities. But he who is satisfied with just the name but fails to act upon the teaching he should remember that God Almighty has decided to make this Jama’at into a very special Jama’at and any person who in reality is not in the Jama’at cannot remain in the Jama’at by simply acquiring the name. A time shall come upon him, sooner or later, that he shall be separated from it. So, as far as is possible, make your actions subject to the teaching which is being given. Actions are like wings, and without actions, a man cannot fly upwards to attain spiritual advancement and he cannot achieve those lofty objectives which Allah, the Exalted, has placed below these good and virtuous actions. God has bestowed intelligence upon the winged animals but if they do not make use of this God given intelligence, they would not be able to carry out the things that they are capable of doing. For example, if the honey bee did not have this intelligence she would not be able to produce honey and similarly messenger pigeons have to make so much use of their intelligence, how they undertake such long journeys and take the letters to their destinations. Similarly many such wondrous jobs are done through these winged animals. So first and foremost, it is necessary that man make use of his intelligence, and ponder on the work that he is about to carry out, as to whether it is in accordance with the will and pleasure of God or not. Once he has done this, and makes use of his intelligence, then comes the stage of making use of one’s hands. He should not be guilty of laziness or negligence. And yes, it is necessary to verify that the teaching is indeed correct. Sometimes it happens that the teaching is indeed correct but man, due to his foolishness or ignorance; or due to someone else’s mischievousness or misguidance, he falls victim to a deception, so one should make proper investigation with a clear mind. The Promised Messiah (as) is advising us as well as others. It is necessary that everyone should have the fear of God and the fear of God will make him inherit many virtuous deeds. The person who fears Allah, the Exalted, he alone is good because due to this fear he will be blessed with an insight by means of which he is saved from committing sins. Most people are of the type that they feel shame when they ponder on the graces and bounties and honors that God has bestowed upon them, and safeguard themselves from His disobedience and transgression. But there is a group of people also who are afraid of His chastisement. In reality, the truth is that the good and righteous person is indeed he who is deemed to be good in the determination of God. There are many people who deceive themselves and consider themselves to be muttaqi [righteous and God-fearing] but in reality a muttaqi is he whose name is written down, in the register of Allah, the Exalted, as being a muttaqi. At this time the attribute of Allah that is being manifested is that of His being Sattar [the One Who is Hidden and concealed and Who covers up the fault and shortcomings of the people] but on the Day of Judgment when all veils shall be lifted everything will be revealed. At that time there will be many such as appear today to be very muttaqi and righteous but they will be seen as being very great transgressors and evildoers. The reason for this is that the doing of good and virtuous deeds can not be accomplished based on our own suggestions and declarations. In reality, good and virtuous deeds are those that are free of every type of discord and corruption because ‘saleh’ [good and virtuous] is the opposite of fasaad [corrupt]. Just as food is pure and wholesome when it is not raw, not fully cooked nor burnt, nor should it be a low-grade species, but it should be such that can immediately become absorbed into the body. Similarly, it is necessary that there should be no type of disorder or corruption in the actions that can be considered to be good and virtuous deeds. In other words, it should be in accord with the commandments of Allah, the Exalted and then it should be in accord with the practice of the Holy Prophet (sa) and there should be, in it, no sign of weariness, nor ostentation, nor conceit, nor should it be something proposed by oneself; if the action is such as described then it can be said to be a good and virtuous deed. And this is a very rare and precious thing. Satan is always lying in wait to ambush in order to mislead man, and to pervert or corrupt his actions so much so that even in virtuous actions he wishes to mislead and misguide him. Hazrat Khalifatul Masih (ab) repeats this last part of the sentence again, “Satan wishes even to mislead and misguide in the doing of good and virtuous deeds,” and says do not think that Satan does not mislead and misguide in the doing of good deeds. “And he makes plans to create some kind of discord or disorder. If Salat is being offered, he tries to mix into it some form of conceit or other kind of corruption. The one who is leading the salat, he tries to involve him also in some sort of such trial. So you should never be unafraid of his attacks, because his attacks on the wicked and evil-doers are manifest and open because they are, as if, his prey; but he does not refrain from attacking the devout also. And finding a way, in one way or the other, he makes an attack upon them. Those people who are under the Grace of God, and are informed of the fine and subtle ways and means of attack of Satan, they pray to Allah, the Exalted, to be safeguarded from Satan, but those who are still in an imperfect state and weak and feeble, they fall prey sometime or the other, to such attacks. Man thinks that it is sufficient to recite the credo [Kalima] with the tongue or to simply say with the tongue, astaghfirullah – I seek forgiveness of Allah – is enough. But remember that verbal deceptive utterances are not enough. Even if a man says with his tongue astaghfirullah, a thousand times, or recite the words of tasbeeh [reciting the words Alhamdolillah (All praise belongs to Allah) 33 times; Subhanallah (Holy is Allah) 33 times; and Allah-o-Akbar (Allah is the Greatest) 34 times] a hundred times, no benefit will be derived from it, because God has made man a man and not a parrot. This is in the nature of the parrot that it keep on repeating sounds with his tongue and does not understand a single thing. The duty of a man is that what he utters with his mouth, he should say after having thought over it and he should also act in accord with what he says. What you are saying, think over it, and then act on it also. But if he goes on speaking like a parrot then remember that just repeating with the tongue draws no blessings unless and until the heart is not in tune with it and actions are not carried out in accord with what is being said – until then these will be considered just utterances and there is no goodness or blessing in them because these are mere spoken words even though they may be the words of the Holy Quran or Istighfar. What Allah desires are actions, this is why, again and again, He commanded that you should do good and virtuous deeds. Until this is not done you cannot go near to God. Some foolish ones say that we have completed the reciting of the whole of the Holy Quran in one day but someone should ask them what benefit did you derive from this. You made use just of your tongue and left the rest of your limbs and organs totally idle whereas Allah, the Exalted, has made all these so that they should all be made use of. This is why it is recorded in the ahadees [Sayings of the Holy Prophet] that some people recite the Quran and the Quran curses them because their recitation of it is mere saying of its words and no actions are done in accord with its teachings. The person who does not act in accord with the dictates and limits of Allah, the Exalted, he makes a jest of the Divine Word, because just reading of His Word is not what He desires. He desires deeds and actions. Remember well that mere utterance of words and repetition of formulas is of no benefit unless and until deeds accompany such spoken words and hands and feet and the other organs are not used to do good and virtuous deeds. Just as by sending the Holy Quran, God took help from the Companions; did they think it sufficient to just merely recite the Holy Quran with their tongues or did they consider acting upon its teachings as being essential? They demonstrated obedience and loyalty and accepted being sacrificed like lambs and then they were bestowed all that they were bestowed, and they were honored and valued by God in a manner, and to an extent, that is not hidden from anyone. The Promised Messiah (as) says that if you desire to get the grace and beneficence of God Almighty then do something, otherwise you will be thrown away like a useless thing. The Promised Messiah (as) says that no person throws away gold or silver or anything good and valuable from his house, but rather he takes care of all such things and stores them safely. But if he sees a dead rat in the house he attends to its throwing away immediately and before any other thing. This is the way in which God Almighty holds dear to Himself, His servants, and grants them a long life, and places blessings in their businesses, and He does not let them go to waste, nor does He let them pass away in a disgraceful manner. If you desire that Allah, the Exalted, should hold you dear and value you, then it is necessary that you become virtuous so that you may be held worthy in the estimation of Allah, the Exalted. Those who fear God and obey His commandments are bestowed a distinction by God that separates them from the rest. This is the secret of how man can attain blessings from God that he should safeguard himself from evil. Wherever such a person lives he is held in high esteem because virtue emanates from him, he deals kindly with the poor, shows mercy to his neighbors, does no mischief, does not bring false cases against people, nor give false testimonies, but instead purifies his heart and remains inclined towards God and is known as a friend of God. The Promised Messiah (as) says that to become a Wali [friend] of God is no easy matter, but rather it is very difficult because for this it is essential that one abandon evil, and also give up bad thoughts and passions. And this is a very difficult thing. To give up moral weaknesses and abandon evil habits becomes sometimes an extremely difficult thing. A murderer can give up committing murder and a thief can give up robbing people but for a morally bad person to give up anger is a very difficult thing to accomplish or for an arrogant person to abandon arrogance becomes a very onerous task. Because he looks down upon others with disdain and then he sees himself as insignificant. But it is true that he who, for the sake of the Greatness of God Almighty, will make himself small and insignificant, God Almighty will Himself make him great. Remember this well that no one can become great until he does not make himself small and insignificant. This is a means by which a light descends upon the heart of a person and he becomes pulled towards God Almighty. All the Auliya Allah [Friends of Allah] that have passed in the world, who are held in great esteem today by hundreds of thousands of people, they considered themselves smaller and more insignificant than even an ant and as a result, the Grace of God descended upon them, and they were bestowed those elevated stations which they deserved. Arrogance, miserliness, pride etc. and immoralities have in them a sort of shirk [associating partners with God] so this is why a person involved in such immoralities cannot receive any share from the Grace of God and remains deprived. As opposed to this a poor and humble one receives the mercy of God. After performing the Baia’at, a person should not only believe that this Movement is true and think that acknowledging this he shall become the recipient of blessings. The Promised Messiah (as) said by just declaring one’s belief nothing happens until good and virtuous actions do not follow. Now that you have entered this Movement, try to become righteous, become muttaqi, safeguard yourself from every evil, pass this time in prayers, spend your nights and days in supplications. When it is time for a trial, the Wrath of God is also excited, and at such a time you should indulge in prayer and charity and use soft language and make the seeking of forgiveness your practice, and pray fervently in your five daily prayers. Just declaring your faith is not of much use to man. Indeed, if, after accepting, a man throws it behind his back and forgets about it, he will not derive any benefit. Then to complain that the Baia’at has led to no benefit will serve no purpose because God Almighty is not satisfied with mere words. Understand that until you carry out good and virtuous deeds just believing does not bestow any benefits. A doctor writes a prescription and gives it to the patient and what is desired is that the patient should get what is written on it and consume it but if he does not make use of the medicines prescribed what benefit will he derive from the mere written prescription that he has with him? The Promised Messiah (as) says that at this time you have repented, now God Almighty wishes to see in the future how much you have cleansed yourselves with this repentance. Now that you have believed, God Almighty desires to set a distinction based on taqwa. There are many people who complain against God, but they do not examine their own selves and the excesses of a man’s own self are what are responsible, as God is Most Merciful and Benevolent. Those who, by entering into this Movement, establish a relationship of fellowship and discipleship with me, what is desired by it is that they may advance to the highest stages of good conduct and good fortune and righteousness and so that nothing by way of discord or mischief, or bad conduct may come near them. They may be strict in offering their five daily prayers. They may be such as never lie. They may not hurt anyone with their tongue. They may not be guilty of any kind of evil. And they may be such as would never even think of being involved in any kind of mischief or excess or diorderliness or rebellion. They should abstain from all manner of sins, crimes, inappropriate actions and inappropriate speech, and all manner of carnal passions and needless and inappropriate deeds. And become the pure hearted, harmless and humble servants of God Almighty. And may no poisonous matter may remain in their being whatsoever. Thus, these are the admonitions that we need to keep in our view at all times. These are the things that will make us the green and lush branches of the tree of the being of the Promised Messiah (as) and by fulfilling them we will fulfill the purpose of our having entered in the Baia’at with him. These are the things that will enable us to win the love of Allah, the Exalted, insha-Allah. And with these same good and virtuous deeds we will be able to draw the attention of the world towards ourselves also. May Allah make us like those true believers who are known by virtue of their faith and good and virtuous deeds and become those who attain the nearness of Allah, the Exalted. After the Jumua prayers I shall lead the funeral prayers of Respected Rashid Ahmad Khan Sahib, son of Respected Late Iqbal Muhammad Khan Sahib. He passed away at the age of 91. Inna lil-lahay wa in-na elaihay rajayoon. He was born in India, Agra and obtained his early education in Qadian and then came to England in 1955. He kept working in British Railway as Chief Engineer and retired in 1980. When the land for Islamabad was purchased here in 1980 Hazrat Khalifatul Masih IV (ra) appointed him as Caretaker there where he served with great zeal. He was from among the earliest residents of Islamabad. He was a sincere man. His father, Iqbal Muhammad Khan Sahib was from Gujranwala. He is survived by his wife and a son Shamim Ahmad Khan. May Allah elevate his station in Paradise. Bless him with forgiveness and bestow upon his son also to maintain a relationship of sincerity and loyalty with the Jama’at. May Allah bestow patience upon his wife and son also.